Birth-Third is about improving the quality of education and care at three developmental levels—ages 0-3, 3-5, and 5-9—while improving alignment across these levels. A central alignment challenge is the divide between preschool and K-3 education, and particularly between community-based preschool and public elementary schools. Preschool teachers have important information about children that often does not make it to the children’s kindergarten teachers, and conversely preschools may lack up-to-date information about the kindergarten experience and kindergarten expectations. Further, both preschool and kindergarten teachers are working on meeting new standards in ways that match their children’s developmental needs—taking advantage of how children best learn—yet they typically do this work in isolation from each other. Addressing this divide requires creating systems, sharing data, and convening leadership groups. Further, communities on the forefront of Birth-Third work often provide joint professional development for teachers and leaders working in public and private early education settings, a strategy highlighted by recently-proposed federal preschool legislation. 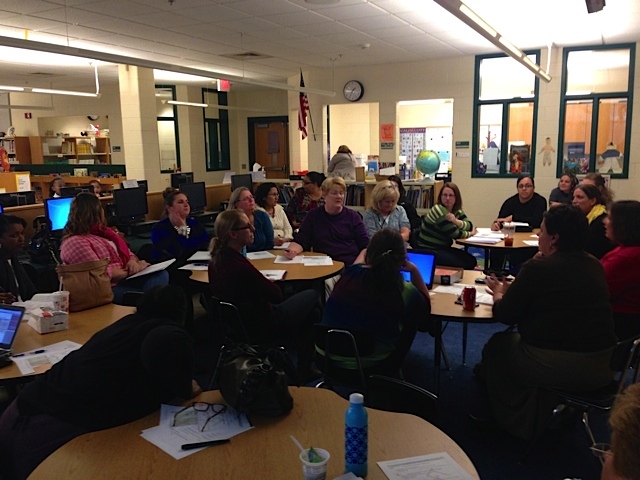 One of Somerville’s Kindergarten Readiness Group meetings this year gives a sense of what joint public/private professional development can be like. In this meeting of approximately 30 preschool teachers, preschool directors, and kindergarten teachers, small groups compared preschool standards from the EEC (Department of Early Education and Care) to the Common Core-aligned ones from the ESE (Department of Elementary and Secondary Education). They then collaboratively sketched out pre-kindergarten and kindergarten lessons that explicitly target English Language Arts standards and that incorporate opportunities for choice and play. In a subsequent meeting teachers extended this cross-site work by sketching out curriculum units based on specific books. 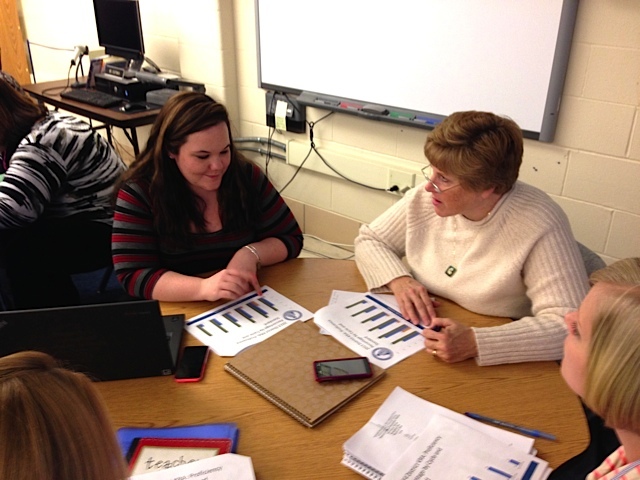 Likewise, Springfield has created a Professional Learning Community in which pre-kindergarten and kindergarten teachers visit each other’s classes and participate in joint professional development on a variety of topics, including the Common Core standards, social-emotional learning, using data, and kindergarten readiness. Both communities have managed to hold these workshops despite the logistical hurdles that this kind of collaboration entails, and in both communities there is a forceful, “of course we should meet, this is so natural and makes so much sense” quality to the participants’ comments about the experience. Both Somerville and Springfield are in relatively early stages in the design and execution of these activities, yet their work thus far begins to suggest the kinds of design decisions joint public-private professional learning entails. This week’s post discusses the role of joint professional development in the context of recently-proposed federal legislation and introduces the activities currently underway in Somerville and Springfield. Next week’s post highlights a number of common themes that are emerging from the work in these two communities and identifies a set of key questions that this kind of direct teacher-to-teacher collaboration raises. Help parents, including parents of dual language learners, understand instructional and other services provided by the kindergarten (“Building Bridges between Pre-K and Kindergarten”). The collaborative activities suggested by this list—sharing student data, developing transition activities, aligning learning expectations, and joint professional development—are key components of the approaches pioneered by exemplary Birth-Third communities such as Union City, NJ, Montgomery County, MD, and Bremerton, WA. In Massachusetts, all of the first five Birth-Third Alignment Partnerships support some form of collaboration between community-based preschools and public schools. In Boston, Lowell, and Pittsfield, the public-private collaboration occurs through leadership meetings and/or coaching relationships, whereas the focus in Somerville and Springfield includes direct teacher-to-teacher collaboration. The Kindergarten Readiness Group in Somerville. Somerville’s Alignment Partnership is managed by the Somerville Public Schools and an Alignment Advisory Group that includes members from different public and private agencies. 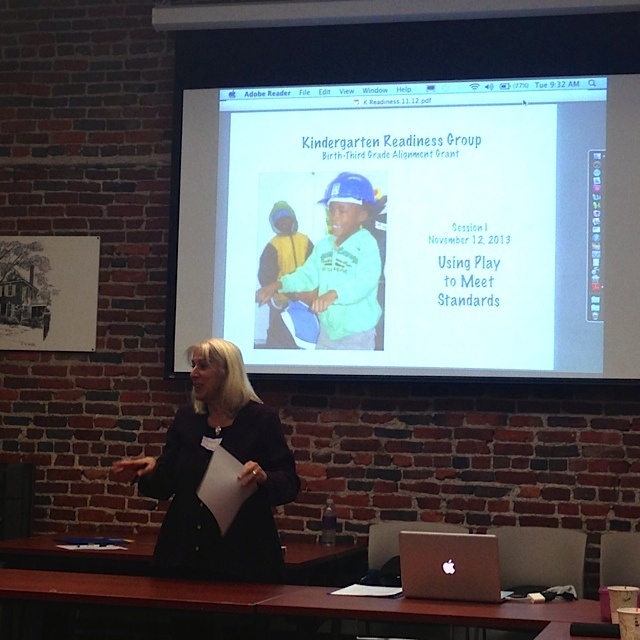 The group has hired Suzanne Gibbons as the coordinator of the Alignment Partnership’s activities. After an intensive period of analysis and planning at the beginning of the grant, the alignment group homed in on a literacy focus and four primary strategies: the kindergarten readiness group, a pilot literacy coaching project involving eight preschool classrooms (plus a language and literacy course for an additional 20 teachers), training for community-based providers in Teaching Strategies Gold assessment, and an informational website for families. The Kindergarten Readiness Group was formed last spring and set about establishing relationships and a forum for communication and collaboration by exploring similarities and differences between prekindergarten and kindergarten. After an introductory meeting, the members conducted hour-long cross-site visits, with community-based preschool teachers visiting public school classrooms and public school teachers visiting community-based classrooms. The members then met to debrief on their experiences and impressions, finding many more similarities than differences. They also worked on developing a transition form to be used by preschool teachers across the city to provide information on their rising students to kindergarten teachers. In the eyes of many participants, these meetings established a climate of trust and an eagerness to continue working together. The partnership’s organizers saw in the Kindergarten Readiness Group an opportunity to address an emerging focus on literacy during the 2013–14 academic year. They planned a series of four meetings for 2013-14, focusing on two related topics: (1) aligning and meeting standards and (2) incorporating play, choice, hands-on activities, and inquiry in student learning experiences. The organizers summarize this year’s theme as Using Play to Meet Standards. Special Note: See Catherine Tighe’s article in the Huffington Post, The Common Core in My Classroom: A Teacher’s View. Catherine teaches Kindergarten in Somerville and is a member of the Kindergarten Readiness Group. Springfield’s Birth through Grade Three Professional Learning Community. The preschool provider, Square One, is the lead partner and fiscal agent of Springfield’s Alignment Partnership. Square One has assembled a “Leadership Steering Committee” to guide the work of the Alignment Partnership and has hired Cindy Recoulle as the project coordinator and Joan Paris as the project consultant. The Springfield partnership has developed a strategy centered on selecting a community-wide preschool curriculum and identifying standards to focus on across public and private settings, including common developmental domains in Teaching Strategies Gold and shared social-emotional standards. The partnership will provide professional development and outreach around these domains and standards (including through the PLC meetings), identify common formative assessments to use across preschool settings, expand teacher-to-teacher observations, and share kindergarten assessment data with pre-kindergarten providers. Springfield summarizes its strategy under three categories: Curricular and Assessment Alignment, Teacher and Adult Caregiver Capacity and Quality, and Data Use and Strategic Planning. Next Week: The what and why of joint professional development and learning from Somerville’s and Springfield’s efforts thus far.